"What is that you are worried about" is an art video  where an energy rebalancing coach heals and cleans the unsetting energies of spaces by putting them into a holographic energy scan. Two artists draw our attention to an old bunker in a Bosnian Town, which used to be Tito's atomic bomb command. The bunker was recently repurposed to serve as a venue for art, however like in any conversion process the transformation of building out of its past traumas to an art center was not easy and required "cleaning/confrontation". In the artwork, the two artists invite the coach to heal this vacant building. In contemporary urban context, there are many vacant spaces, creating absence of context and programme, failing to connect the elements of a city in a coherent way. They become "the mental exteriors in the physical interior of the city". These voids in the city could be the results of fiscal policies or the city's modernization, reconstruction and development mechanisms. Sometimes they appear simply because they fall outside of the urban environment's functional and productive circles; while other times they are perceived as phenomena, which grow parallel to deindustrialization, suburbanization or shrinkage. Or like in the above-mentioned video, could be the result of a dictatorbs fears. The particularity of vacancy is embedded in its specific context, history and culture. Galata Greek School is both a heritage site representing the Greek [Rum] history of Istanbul  and a vacant building, which has impervious borders within the urban context and the public realm. Recently the school administration aimed to re-purpose the building into a cultural centre. Instead of becoming another black box in the city's memory, by means of transforming into a cultural centre, the school is holding the context for exploring new purposes. It could offer a flexible alternative to the predictable urban environment especially in fluctuating, dynamic, ever-changing networks of Galata neighbourhood. It could provide the possibility to experiment on a variety of programmes within the culture function, ownership and authorship models, as well as forming a perpetual part of a network that connects it to other buildings of its kind and to the city. Repurposing Galata Greek School entails investigating these questions: Is the new aimed function suitable to the architecture of the building? Should we look for a match between the new function [body] and the original design [skin] of the building? How does the new function communicate with the history of the building and the memory of the city? This article presents the Galata Greek School repurposing process, dissecting the complexity of its context, its position in the memory of the Greek community, the neighbourhood and the city of Istanbul. Considering that the School is not in use for its actual function, the change of the socio-economical structure of the neighbourhood, and that the school belongs to the Greek community, a series of activities  were organised to fully grasp the dimensions of the context. 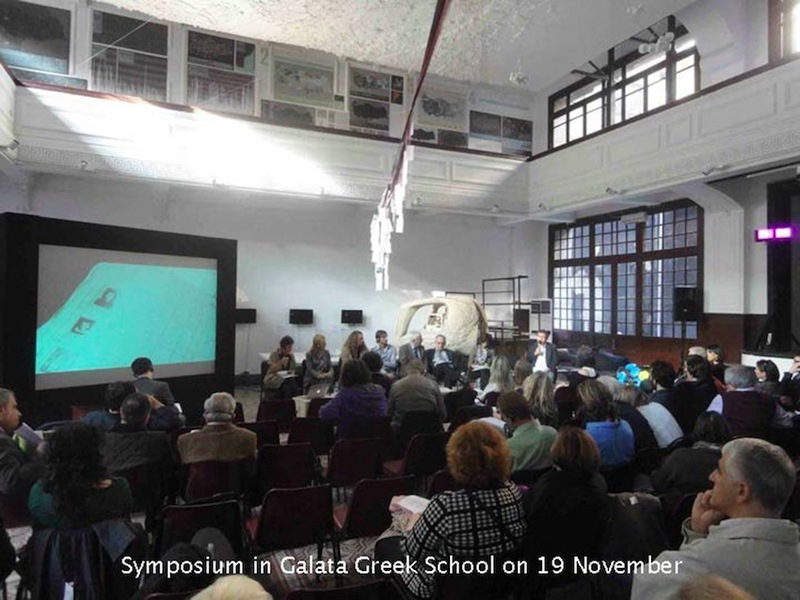 Experts on cultural programming and management, and architects from the Netherlands, Turkey and Greece worked a vision and mission for Galata Greek School. Questions on how the building could be the "common ground" in the neighbourhood and the city, while representing the Greek community, the management and possible re-use scenarios for the school were analysed. At the end of a colloquium and two intense workshops, a working method on how to repurpose Galata Greek School was created. Galata neighbourhood's history goes back to 13th century Istanbul, and that of Greek School back to 1853. Zarifi family commissioned the building for the Greek community as an elementary school. After 1950s, following major political unrest, the school was confiscated by the state and became the property of the Ministry of Education. In relation to the fluctuating political context, the population of Greeks in Istanbul has significantly decreased until the present day. This century old community school was out of service for more than 2 decades over different periods. A recent law [2009-2012] on returning confiscated properties to their initial owners, made it possible to return the building to the Greek community, which started the whole discussion around repurposing the building. As of 2010, Galata and its surrounding old port district have been undergoing a strong gentrification process for more than a decade. Designer shops and exhibition spaces have been replacing the small scale production ateliers; hotels and cafes are popping up at every street corner. The already existing cultural institutions network in the neighbourhood is getting denser. A new urban plan [so called Galata Port] for the old port district acknowledges and supports this transformation fully, erasing the existing industrial heritage and proposing tourism economy at the port. The conservation development programme of the Municipality, which includes renovation of the monuments in the district, indirectly accelerates gentrification in the neighbourhood, as well. The lack of participation in decision-making processes and the balance between public good and profitability remain controversial not only in Galata, but the whole city of Istanbul. The idea of transforming the Greek School into a cultural center entails embracing the complex memory of the neighbourhood, the community and the city. The school has a symbolic meaning to the Greek community. It was the first building returned to them, hence decided to be treated in a different way than the others that had been confiscated and were returned within the same legal procedure. Eventually, the Greek community had one agenda for the building: It will be re-functioned as a cultural entity and expect no profit. The building belongs to the Galata Greek School Foundation. Administration of the foundation is realized through two boards: Advisory and executive. Advisory board has more than ten professionals from art and cultural scene of Istanbul and Greek community, and the Executive board is composed of elected individuals from the members of the Foundation. The board is interested in keeping the building as an example of public space in Galata. Yet, many questions pertaining to vision and mission remain: how should the building represent its Rum identity? Will it keep its original "education" mission? The cultural entity that Galata Greek School embodies should be open to all cultures, ethnicities, societies. In this respect, the most important characteristic that should be sustained is the "locality" of the new cultural entity. This way, it can truly take its position in Istanbul's memory. This new entity should act as a catalyst between the community and the city. Throughout the repurposing discussions on the Greek School, two main axes of thought were the Greek culture and history; and civilization in Istanbul as a more comprehensive concept than only culture. While considering these two, the emphasis should not be missed on the cosmopolitanism of the city and the neighbourhood as a source of building an inclusive approach. Along these main axes of thought, the core principles of the new institution are set as autonomy and accessibility, contributing to the democratisation of culture and providing freedom of speech and art, institutionalizing while remaining civil. Architecturally speaking, the building posits its own history and plan in front of the experts. How can a building designed to be a school for elementary grade children respond to cultural purposes? What can we do in a building, which is 2nd degree monument, i.e. it is not possible to touch the front façade and permission needs to be obtained for interventions inside the building? How to approach the compatibility with building regulations, for instance the need of an elevator and fire escape staircase, i.e. integrating these new obligatory elements in the building in a way that will serve programmatic purposes? The original architectural design of the school and its location in the site/neighbourhood inherit certain potentials and drawbacks. These characteristics are (1) the building has only one fully visible façade, which is quite closed/bulky in neoclassical style and opening to the rather traffic-busy road; (2) the contemporary regulation obliges an elevator and fire escape in the building; (3) the narrow courtyard and the roof terrace are the only open spaces of the building. The closed image of the bulky front façade could be broken off by means of employing the potentials of the plots next door and at the back, letting the school building open up more to the neighbourhood, physically. Communicating with the owner of the plot behind the building to use the same entrance space for both buildings is another idea to enable the school to be approached from the back street. Plot swapping between the near by property of the school and the back plot owner, buying the adjacent and/or the back plot with the income that the near by property of the school will create, are some of the strategies that could be applied. Another intervention proposed is a "zebra crossing" across the traffic-busy road, to the port district. In addition to slowing down the fast vehicle traffic flow, this zebra crossing could also be a metaphor, representing that the building was once a primary school. The missing link between the building and the neighbourhood is quite obvious, but also the spaces within the building require to be connected. An axial shift of the entrance to the building seems like a good solution here: Converting the shop, which is on the same axis with the only open courtyard at the north side, into the entrance of the building, hence connecting the front façade to the back plot; and this entrance volume housing an elevator and the fire escape stairs within, is a solution that will both better connect the building to the neighbourhood and the spaces within the building, by means of employing the elevator and the fire-escape stairs as programmatic elements. Since its return to the community 2012, the School has housed two art and one design biennales and several individual exhibitions, performances, concerts and meetings. The school is managed in a very conventional way. A board controls the administration, finances and maintenance of the school building. The cultural persons/organizations that want to use the building pay a total fee or contribute to the renovation of the building. For instance, Istanbul Foundation for Culture and Arts [IFCA] has hosted the Istanbul Design Biennale in the building and directly helped with the simple restoration of the building. Considering the issues and principles discussed so far, some new functions that come to the fore are: Technology oriented education and learning school, transitional activities [continuous temporary functions], educational activities [exhibitions] illustrating the history of education and Greek community, [maybe] one permanent exhibition, multi-functional cultural centre as a contribution to Istanbul's public culture. The principle of autonomy brings together the mixed-funding model rather than single source funding. The new institution should be non-profit and communicate with the city through enhancing each othersb culture. The Galata Greek School has to be considered in a network of cultural entities within the Galata neighbourhood. This network should be emphasized in urban design scale. Adding to the programming and management principles, which were debated during the colloquium, mentioned above; keywords for programming and management were worked out during the workshops: Learning by playing, Agora, and Cultural Courtyards. Strategies were also driven for status quo, temporary and permanent stages of the building. Learning by playing is a keyword for the Status Quo and Temporary stage, pointing at the importance of trials and errors, collecting experience by exploration and working more informally, without necessarily a strict plan. The Agora and the Cultural Courtyards refer to the functioning of the main hall and the classroom level connecting spaces, respectively. The main hall of the school which is on the ground floor when entering from the back street, was put forward as the first holistic space that the visitors will face entering from the front street. The metaphor Agora was selected for the functioning of this space. The Agora [gathering place or assembly] was the central spot in ancient Greek city-states. It was the center of athletic, artistic, spiritual and political life of the city. In a similar line of thought, this main hall of the school could function as the heart of the building. The Cultural Courtyards idea evolved from the wide inner connecting spaces of the classroom levels in the school, which tie 18 big rooms together in 3 floors. One drawback of the classroom levels is that they are completely unattached from each other, which means very little interaction possibility. This reality might not necessarily be unwanted in the permanent phase, when for instance there is a library and office spaces in these floors; however, during the temporary functioning phase, this cellular structure is a disadvantage in terms of creating more attraction/connection/communication within the spaces of the school. In order to deal with this, the idea of Cultural Courtyards was proposed, meaning the inner connecting spaces of the classroom levels should become common activity spaces. In the Status Quo stage, a pedestrian street could be created in the building, by shifting the entrance axis [explained earlier in this text], and connecting it to the open courtyard and the back plot. A vertical connection to the roof could be set up by the elevator and the staircases in the new entrance space, creating a magnet at the roof terrace [restaurant, cinema, roof garden etc], generating vertical pedestrian traffic in the building. Simple maintenance of the building might be possible by the income from renting the shops on the ground floor and the magnet at the roof. These interventions were suggested in order to connect the building to the neighbourhood. At the Temporary Stage, a curator could be appointed to start with experimenting the cultural programme. The curator could be a single person or a board of programmers. This curator might change over time, periodically, until the structure of permanent stage is decided. This temporary stage is for experimenting with the public qualities of the building, how it will relate to the neighbourhood in terms of function, what functions will develop the audience to the building. This is of course an iteractive process. In addition, this period could be treated as a schedule of raising awareness and ownership within the Greek community about the building, and deciding on how the Greek identity will be represented in the building. At the Permanent Stage, the permanent functions under the common vision and mission are found, a management and financing strategy is to be applied. Galata Greek School has an unique position in the memory of Istanbul, relating to the Greek communitybs history in the city, hence its emptiness requires a much deeper understanding of the notions of history, heritage, public, urban,... These notions come together to hold a very special context-based case of repurposing, which we tried to present and discuss throughout the paper. One of the challenges that Galata Greek School faces today is the discrepancy between the conventional tendencies of the existing administration and the uncertainty of numerous possibilities [varies from a museum for children to multi-purpose cultural center...amp;] that hold the potential for exploring the alternative ways of existence. The current ambiguous context partially stem from this temporariness but also the political realities, such as the prolonged legislation for the change of election system of executive boards of Minority Foundations due to bureaucratically disabled state mechanisms. The way to deal with this problem is inherent in its temporality. Temporal stage has been suggested as a certain period of time, for exploring, learning by doing, letting several alternatives pour in to the school, which would enable the programmer/manager see the best options for repurposing the school in the long run. This could be also an ideal time to test the structure of the management, looking for funding and realizing the necessary renovations in the building. These new ways of programming are being tested in the school very slowly, but still a major step needs to be taken in terms of how the programming and the management will proceed together. The Galata Geek School Foundation has seized the possibilities of the temporary times and appointed a Greek - Armenian artist, Hera Buyuktasciyan as the artistic manager of the programmes. Since May 2013, she runs the programming of the building. On one hand, she pays attention to ties/network among the school, the Greek community by rebuilding an archive of the School and hosting exhibitions, talks and concerts on Greek culture. On the other hand, the building continues to host various art and culture events that welcomes wide-range of audience from the neighbourhood and the city of Istanbul. Last years' Gezi protests  in Istanbul clearly displayed the need and demand of such ties to be established, where the idea of "public" is articulated. Besides, the School holds a great chance for bonding the Istanbulite-Greek community back together, not only in Istanbul but also elsewhere in the world. Creating the sense of belonging and ownership are the two paths forward. 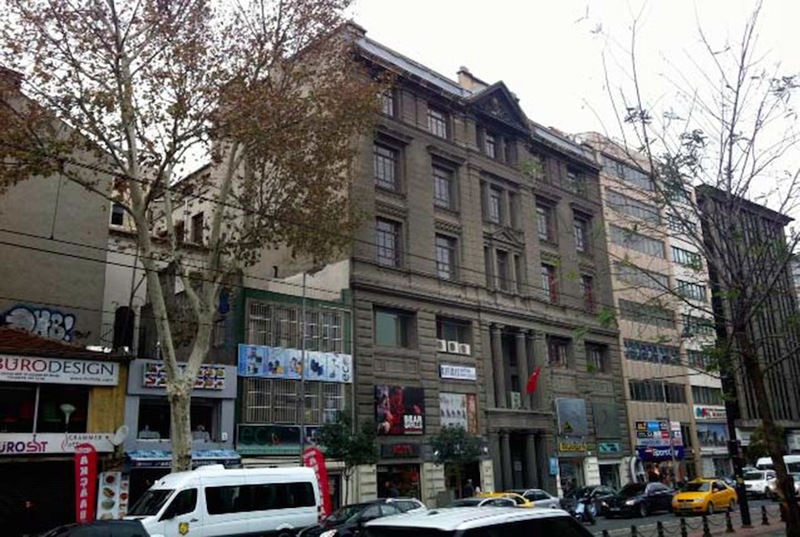 These characteristics of Galata Greek School create the unique base to locate the school as a cultural entity in the existing network of cultural institutions in Istanbul. MERVE BEDIR graduated as an architect from the Middle East Technical University in Ankara in 2003. She was involved in a variety of architectural design projects in Turkey, Egypt and Georgia until 2008. She is a PhD candidate at Delft University of Technology and the partner of Rotterdam/Istanbul based office Land+Civilization Compositions. AYÇA ÍNCE studied urban and regional planning at Mimar Sinan Fine Arts University [MSGSU], and has received an MSc from the "Cities, Space and Society Programme" at the London School of Economics and Political Sciences , and an MA in Sociology from MSGSU . She was granted a PhD degree in 2012 after defending her thesis in sociology at MSGSU, entitled "Isomorphism in Cultural Policies: An Example of District Municipalities in Istanbul and Cultural Centres." She is an independent researcher on urban sociology, local governments and cultural policy. Art work "What is that you are worried about?" by Banu Cennetoglu and Yasemin Czcan, first shown at the 2nd edition of Project Biennial D-0 ARK Underground (2013), Unrest of Form/Imagining the Political Subject, Vienna - Secession, later at Rodeo Gallery, Istanbul between February 25 - April 19, 2014. Istanbul is a city of temporariness and informality since the 15th century. After its cession, immigrants to the city were allowed to inhabit the vastly available empty buildings. Since then, Istanbul has witnessed major population composition changes and their reflections, both in terms of urban culture and environment. Galata Greek School is one of the many cases of this phenomenon, which belongs to one of the oldest, the Greek [Rum] community, in Istanbul. The school has been vacant for more than two decades over different periods. [3 ]This paper is partially a report of the Workshops conducted for repurposing Galata Greek School. Therefore, we would like to mention here and thank everybody included in the organization process and workshops: Netherlands Architecture Institute, Galata Greek School Foundation; Meri Komorosano and the administration board; Chris Luth and Ole Bouman from the Netherlands Archictecture Institute; consultants of the administration board: Osman Kavala, Korhan GC<mC<e, Laki Vingas, Makis Bachtiar, Nikos Kalogeras; contributions during the process: Eva Şarlak, Görgün Taner, Han Tümertekin, Nevzat Sayın, Aykut Köksal, Foti Benlisoy, Edhem Eldem, Elçin Macar, Ari Çokona, Hasan Kuruyazıcı, Kyriakos Koutsomallis, Agathoniki Tsilipakou; the workshop team: Group A, Doepel Strijkers, Arkizon, AboutBlank, ZuMimarlık, Dafni Mimarlık, Eva de Klerk, Per Plek City, Studio Iris Schutten. And also Hera Büyüktaşcıyan for updating us about the current situation. Please see the link [http://reclaimistanbul.com/2014/01/27/occupygezi-the-park-revolution/] for causes and outcomes of May-June 2013 protests and the blog itself to follow up.